With as much content as you’re competing with for your audiences’ attention, it’s worth looking into differentiating your content and standing out. There’s a simple way to do this: with interactive content. 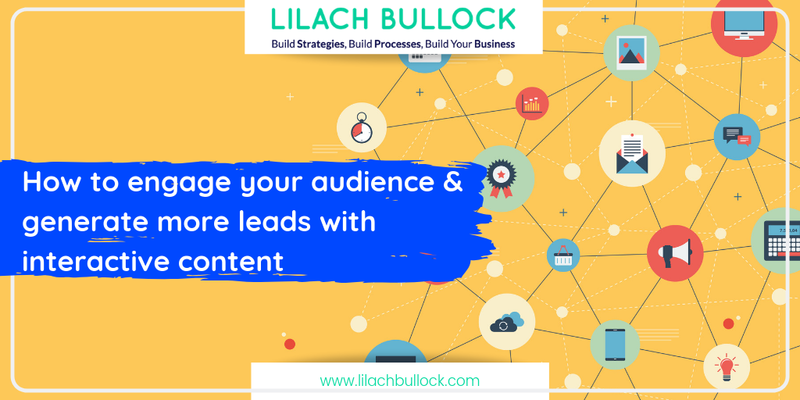 In this blog post, I’m going to show you how to show you how to engage your audience and generate more leads with interactive content. One of the big reasons, as I mentioned earlier, is that interactive content helps you differentiate yourself amongst your competition. It gets your audience to actually engage with you. More than skimming through a blog post and writing a comment, or liking a social media update because it popped up in their update. People will take the time to use your interactive calculators, provide you with all kinds of useful information while responding to your polls, or to have a laugh and test their knowledge with one of your trivia tests. It’s great for research. With interactive content, you can ask your audience all kinds of useful questions – including questions about themselves, that can help you better understand your audience, what they like, and what they don’t, and so on. It’s great for lead generation. Interactive content can help you attract a broader audience and generate more leads for your business as you collect their contact information. It drives traffic. Reaching a broader audience can also lead to more traffic to your website and blog. Just look at Buzzfeed – their polls and quizzes were an integral part of their success. Plus, interactive content helps you build an experience around your brand. To educate: one of the golden rules of content marketing (at least as far as I’m concerned), is that you need to offer some kind of value to your audience. That’s why educational content is so popular; but, why not take it a step ahead and turn it interactive? It will not only impress your audience, but it will also make for a better reading experience for them. For example, you could create an interactive PDF; then, add animations to improve the experience, and use the opportunity to insert a lead form in it to collect more information from your audience. To entertain: another way of using to interactive content is simply to generate more awareness and drive more traffic by giving your audience a good reason to visit your website: with a fun quiz, poll, or personality assessment, for example. To research: if you want to learn more about your audience, polls and surveys are the best way to go. If you want to start an app, you have 2 options: start one from scratch (using a template, or completely from scratch), or import one of your own PDFs. 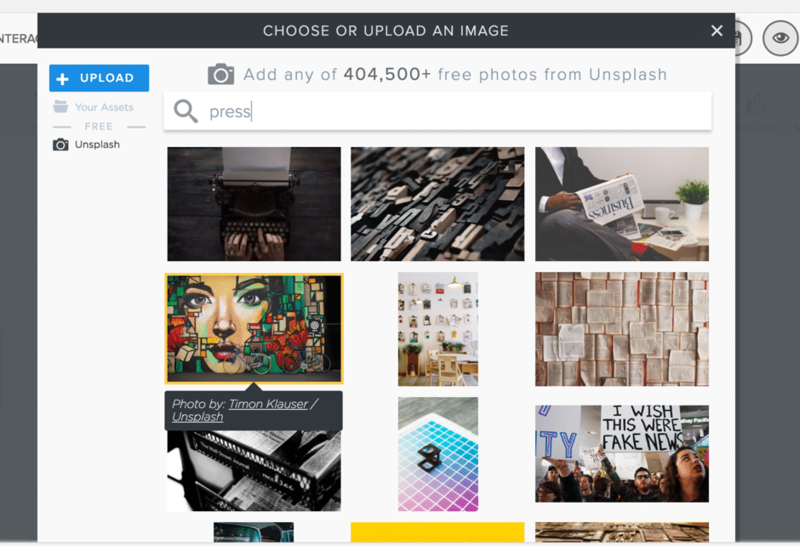 Before getting started, you can use your Asset Library to get all your media and other assets uploaded and ready to use; for example, your logo and other branded media, your font, and so on. Getting started with SnapApp is extremely easy; the builder is quite similar to PowerPoint, in fact. 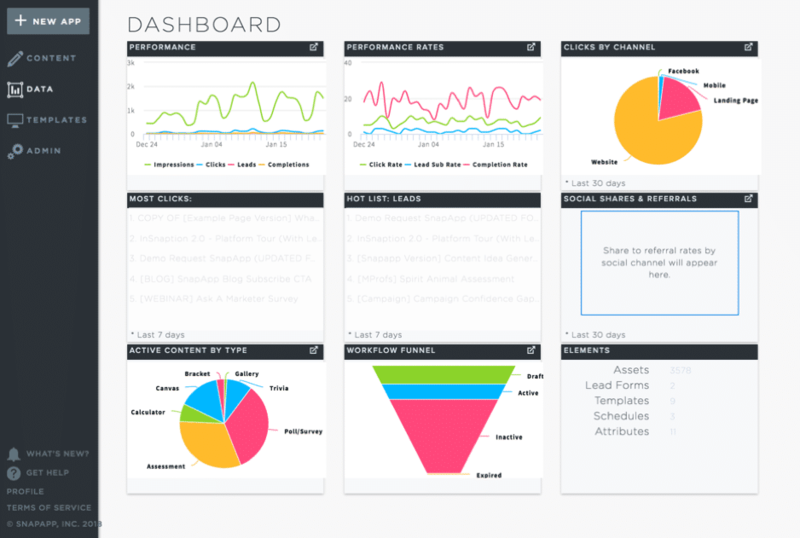 It was built with marketers in mind, so the goal was clearly to make it as easy and intuitive to use as possible. I’ll pick a poll/survey for now. 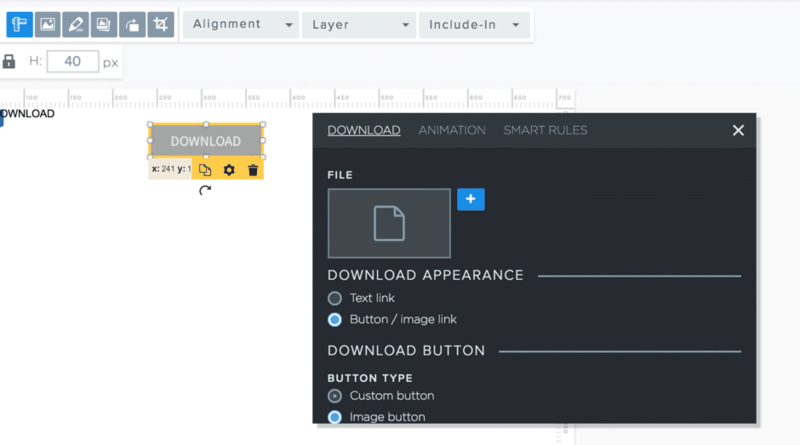 Depending on the type of interactive content you’re trying to create, you’ll have different add-on options possible at the top of your builder (such as adding text, media, or a chart among others). In this case, since I’m creating a poll/survey, I can’t add a lead form (although I can add a download button), but I can include any of the other interactive elements that I want to. From this point, it’s all about customizing your content as you wish; add your logo, add in the text and customize it with different fonts, sizes, and animations, add social following and sharing buttons, add images and other media, and so on. Getting the hang of it is very easy; that’s one of my favourite things about SnapApp. Although I have some experience creating different types of content, I’m not exactly a designer – far from it. This interface makes it very easy to get the hang of it in a matter of minutes. To put it differently, if you’ve used PowerPoint and a basic photo editing tool, you’ll easily be able to master SnapApp. Which is pretty remarkable considering what you can create with it. That being said, you do also have some advanced options. If you go in “App Settings”, you can use custom CSS and JS code to make more changes to your content. 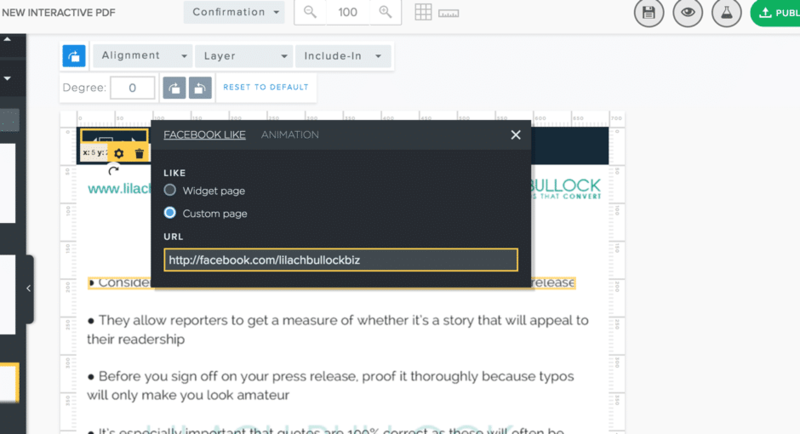 As you create apps, you can start scheduling your content to be published. As well as creating interactive content, you can use your account to track your results as well. If you’re a regular reader, you know I love analytics and always preach their importance; without analytics, you can’t understand what works and what doesn’t. And how else can you improve your results if you don’t know all this? 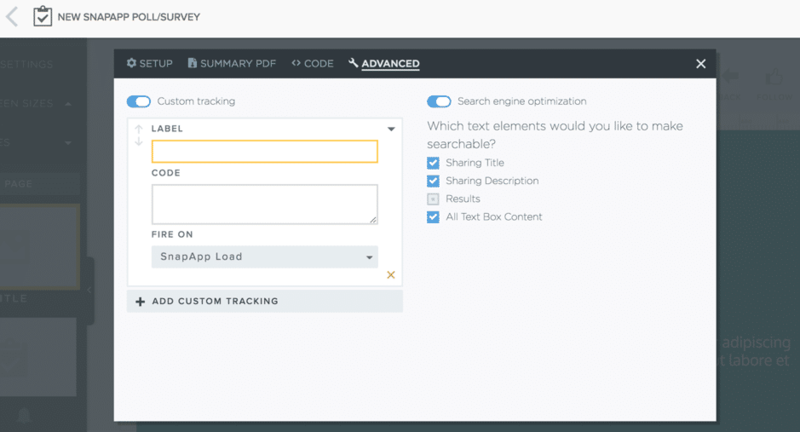 All relevant information, such as your top performing content, your clicks and leads generated, your results by channel, and so on, are all monitored and provided in your SnapApp dashboard. As I mentioned earlier, you can also create an interactive PDF using the free tool from SnapApp, LeadRev. As you can see at the top of this screenshot, you have multiple options for adding interactive bits to your PDF, such as images and shapes, videos, charts, social media follow and share buttons and more. You can also easily move around all the different elements on your pages, simply by dragging and dropping them. You have the option to edit each section of your document. For example, you could add borders to one of the paragraphs, rotate and crop images and other sections, add hyperlinks, and more. Once you’ve created your interactive PDF, you can quickly preview it before publishing it. Have you tried using any interactive content so far?